Hot News! The IC-7000 received FCC certification on November 15, 2005. FCC ID: AFJ242700. Click link below. Here is some preliminary information from Ueda Radio Ltd. on the newly-announced Icom IC-7000 radio. Here is a summary. 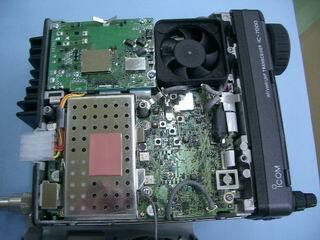 The first part is an interior shot of the IC-7000. How is it? It has become substantially simpler, as compared to the IC-706 MK II G of the preceding generation. When one compares the IC-7000 to the product of over ten years ago, one will observe immense technological progress. Note the efficient muffin fan, which exhausts heated air from the interior. This photo shows the underside of the chassis. It is very simple. ICOM IC-7000 preliminary information! ! ! Part 2. Here is some more preliminary information from Ueda Radio Ltd. on the newly-announced Icom IC-7000 radio. Now, let us take a quick look at some screen images. 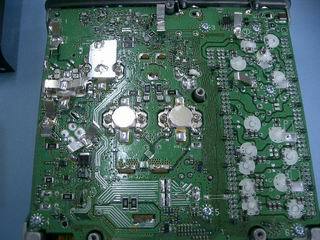 This is the start-up image, which is similar to that of the IC-756Pro series. It changes to the operational image in approximately 3 - 4 seconds. The radio is in a state where the band scope is turned to ON. When one compares this to the IC-756Pro series, is the scope activity a little more sluggish perhaps? When the band scope is turned on, it has become a slight matter of concern that a "tap-tap" sound is heard and the received audio is interrupted (due to the scope sampling process). We observed this phenomenon in a prototype unit displayed at Ham Fair. This must be how the IC-7000 works, even in the production version. This picture shows the PA temperature indicator. I believe it is an interesting gimmick. 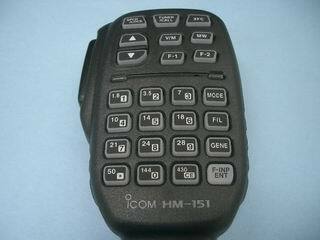 This is the HM-151 microphone (with control keys) for the IC-7000. With this microphone, the user will be able to control IC-7000 functions to some extent. The above is abbreviated preliminary IC-7000 information. Due to the short time we had to collect data, we have only been able to present a partial picture. We should have more complete information by the end of September 2005. It was worth the wait! 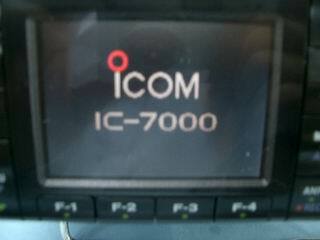 The first IC-7000 100W radio has arrived today (14 Sept. 2005). Initial stock is limited to one unit. By all means, please come to our [Ueda Musen] store; we will offer a special commemorative price. 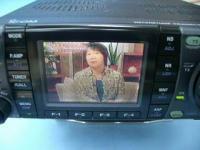 Here you can see the received television picture on the screen of the new ICOM IC-7000. The antenna which is being used to receive the TV signal is the DIAMOND ANTENNA D-130 Discone Antenna, and the TV image is an NHK educational broadcast. 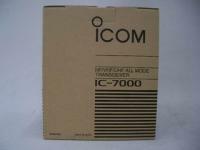 One limited batch of IC-7000's arrived at the store, and sold out completely. The next shipment is expected at the end of this month. 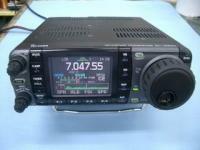 ICOM IC-7000 preliminary information! ! ! Part 3. This is the third announcement of preliminary information from Ueda Radio Ltd. on the newly-announced IC-7000 radio. This time, we have information about a receive Coverage enhancement. This increases the receive coverage to 30 kHz ~ 199.999 MHz and 400 ~ 470 MHz. Icom will offer the receive frequency coverage update free of charge to customers purchasing the radio. The next shipment of IC-7000's is scheduled to arrive at our store by the end of September 2005. This is fresh new product information as of 2005/09/21! 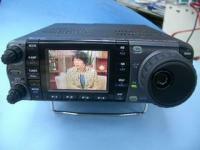 As we have anticipated for a long time on this blog, the ICOM IC-7000 will be arriving in quantity tomorrow, 10/1/2005. It was worth the wait. Please come to the store and pick one up! Here is a regular information update from Ueda Radio Ltd. The demo model of the new Icom IC-7000 product has arrived, and was worth waiting for. We are planning to display it for a while in the Ueda Radio store. Please stop by at our store this weekend. 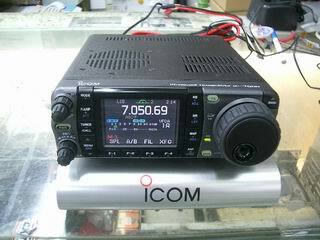 We have made arrangements to stock the IC-7000. Additional IC-7000 Versions: The IC-7000M (50W rig) and IC-7000S (20W rig) will probably be on sale before the end of this year. Look what our sources located - a really cool IC-7000 video! The IC-7000 received FCC certification on November 15, 2005. FCC ID: AFJ242700. If you "slide" the manual notch filter (MNF) right up to one flank of the IF bandpass filter, it will tend to sharpen up that flank. Now if you place one of the IC-7000's dual MNF's close to each flank of the bandpass filter, it will improve its shape factor. If you position an MNF on each side of a weak CW signal, you are constructing an incredibly narrow DSP bandpass filter. By moving the 2 MNF's around, you can optimise the filter for the best rejection/ringing or noise bandwidth/ringing trade-off. In SSB mode, set 'COMP LEVEL' for approx. 6 dB compression on voice peaks. Although there is no VSWR indication on the 2m or 70cm bands, the VHF and UHF PA stages are still mismatch-protected. To quote the IC-7000 service manual (p. 3-7): The VHF/UHF APC detector circuits (PA unit; D501, D504, D401, D404) detect the forward and reflection signals and convert into DC voltages. The converted DC voltages are combined and applied to the ALC amplifier (pins 1, 2) as "VUFOR" voltage. Thus, it will be seen that even though the IC-7000 VSWR indicator does not operate on the 2m and 70cm bands, the VHF and UHF PA's are nonetheless protected. A sudden drop in Po will indicate a high VSWR condition. It has been observed that the IC-7000's transmit standing current is approx. 4A in SSB mode, without audio input. 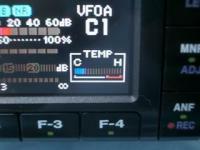 Users have also reported that the radio runs "quite warm". The TX driver stage, Q504 (DRIVER Unit), is a single-ended PD55015 MOSFET operating in Class A with Vdd = 13.8V (nom.) The driver alignment procedure (IC-7000 Service Manual, Sec. 4-4) specifies 1A driver standing current. If we assume that the HF/6m PA stage has 15dB power gain, Q504 must deliver 3W for 100W output. As the efficiency of a class A amplifier is approx. 20%, the DC input to this stage will be about 15W whenever the transmitter is keyed. This equates to 1.1A at 13.8V - about 25% of the 4A standing current noted above. In addition, Q504 will dissipate approx. 15W without drive - a significant contribution to the radio's thermal budget. 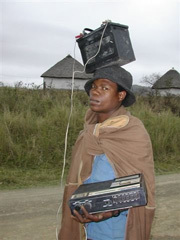 The IC-7000 is not the optimum choice for manpack service. Its standing current consumption on receive/standby is 1.3A (vs. 0.3A for the IC-703). I would estimate that it draws approx. 8A at 5W output, and 11A at 10W output. The TX driver stage is Class A, and dissipates at least 15W key-down with or without drive. You will need a battery-wallah to wheel a trolley-acc behind you whilst you are trudging through the wilds with your radio on your back (or at least a very large dog by your side, with battery-laden saddlebags over his back.) The advantage of a human (as opposed to a canine) assistant is that he can also brew you a cuppa during breaks or poor prop! In addition, a human can work the pedal-generator when the battery gets low. During WW2, the battery-wallah was always recognisable as the member of a 3-man Royal Signals infantry radio team who had the acid-burn holes in his trouser-cuffs. Translation and page creation by A. Farson VA7OJ/AB4OJ. Read my IC-7000 Evaluation Trip Report (PDF). IC-7000 Review by Phil Salas AD5X (PDF). View a large picture of the IC-7000 (image courtesy Icom UK). View a video of the W8LX DSP IF Filter Test, by Scott N7SS. Download the IC-7000 TVRO/Mars Mod. Scott, N7SS' IC-7000 Frequently Asked Questions (PDF). Last updated: 03 September, 2018.